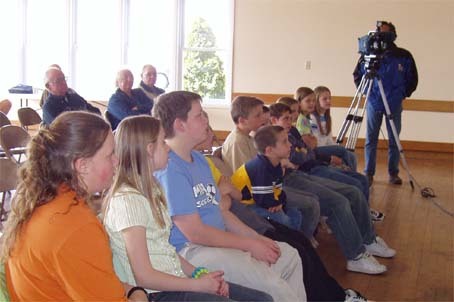 On Friday, April 29, some kids from my class went to the Farr Center. We went there to plant trees to replace the trees that were cut down last year. 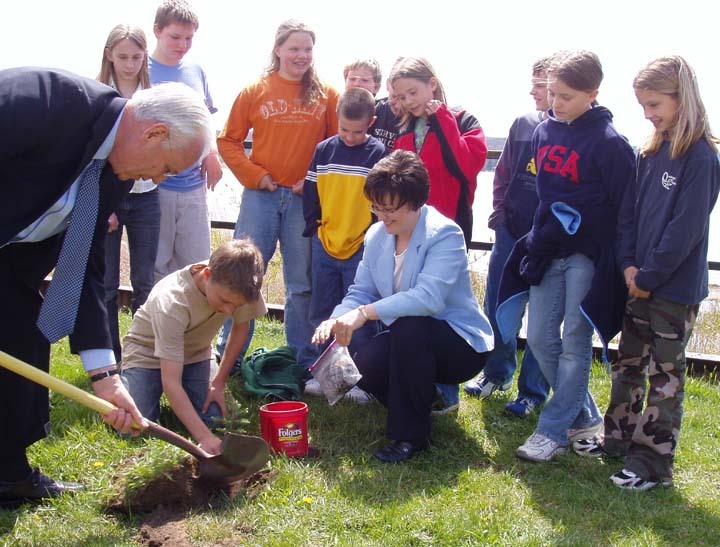 Before we planted the trees we heard a few people talk. There were two news stations there. 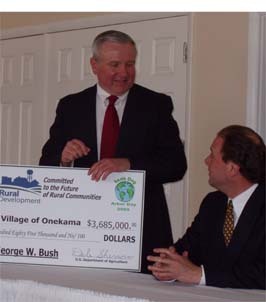 Then some people gave Onekama a grand for almost four million dollars. We went outside to plant the trees. We got to plant one of them. It was great. We even got to have our picture taken with the giant check. Last Friday some of us went down to the Farr Center. We went because of the trees which were cut down on Mill Street. We were introduced by the senator. 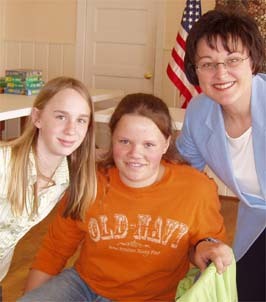 We were given $3,658,000 dollars for the community through a grant from the federal government. The money will be used to repair the water and sewage system for the village. 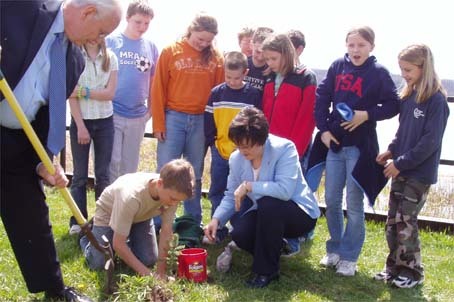 We also got to plant little trees. When it was over we walked back to school. 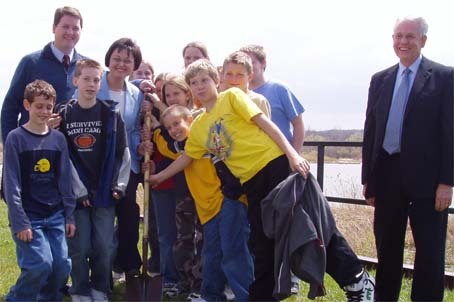 Ten people in our fifth grade class went to Farr Center to celebrate Arbor Day. We listened to very important people talk. They talked about how kids are the future. 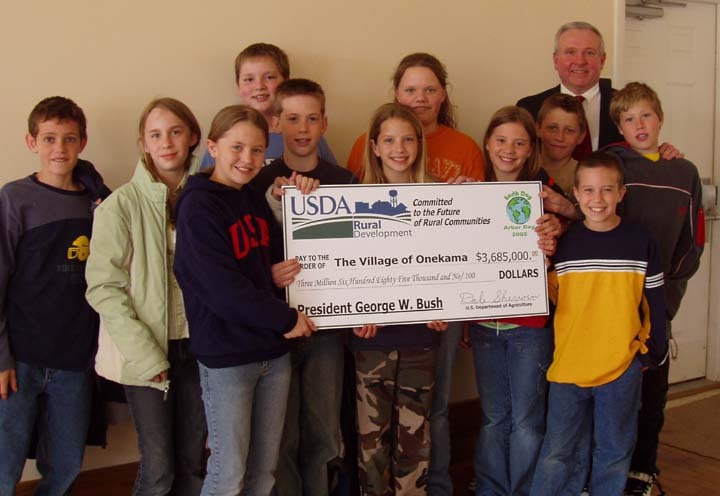 The Village of Onekama got almost $4,000,000. 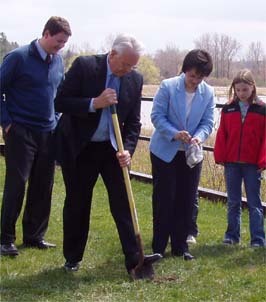 Then we planted two trees. When we went to the Farr Center in down town Onekama we heard a talk about Onekama. 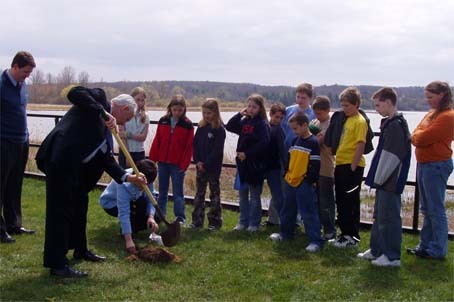 The senators talked about the beautiful trees in Onekama and about the septic pipe a little. Then at the end they gave us pens. It was fun. Mr. Franz is pleased to accept the check to repair the water and sewage system in Onekama. 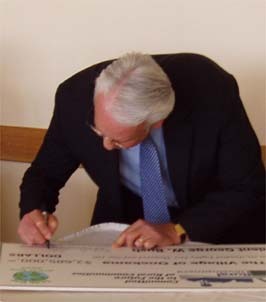 State representative David Palsrok, Senator Michelle McManus, and representatives from Pete Hoekstra and Debby Stabenow's offices were in attendance.